How to get Wifi in Italy? You can continue to use your usual mobile phone plan abroad to make calls and to use your favorite apps on your smartphone. However, be careful about very expensive roaming fees, which can become astronomical faster than you think. For example, providers like Sprint or T-mobile will charge you $2/MB. Knowing that on average, we use 500MB per day, it can make a really huge bill at the end of your stay… such as $10,000 for 5GB in 10 days! Some operators offer special plan or option for your travel abroad, but this is still a costly solution. If you are staying in a hotel, you should have a Wi-Fi access, however, this access is not always free depending on the hotel policy. It can also be limited to only a part of the hotel (e.g. in the hotel lobby). That way you can connect to the Internet in the evening and telling your friends your adventures of the day. You can also enjoy outside the wifi hotspots providing by restaurants, bars and other touristic places, that you will find on your way. Be careful, the Wi-Fi access may require to buy a drink or something to eat, and can be limited in time (e.g. one hour). If you are lucky enough to travel in a Italian big city as Rome, Milan, Turin or Naples, some offer public Wi-Fi access on most visited places. You only have to connect to the public wifi network and to register online on the dedicated platform. There is a little damper however, you need to stay put to keep the network. Be careful, the debit is very slow and limited and can quickly be overloaded if too many people try to connect at the same time you do. Also, pay attention to your data security when you are connected to a public network. Don’t connect to “risk” sites (e.g. your bank website) and don’t share your personal data. If you are looking for a solution which allow you to use freely Internet, you can buy a SIM card from a local operator and put it in your smartphone. You will have a new phone number and you will enjoy calls and datas at local prices, usually much lower than roaming fees. Nevertheless, this option forces you to remove your original SIM card from your phone, making you unreachable. If you want a solution which allow you to stay connected throughout the day and during your whole trip, renting a pocket Wi-Fi is the best option. These tiny mobile hotspots provide you a high speed private Wi-Fi network at 10 meters around, which guarantee you a data safety. You can use the Internet as usual while keeping your own SIM card in your phone and thus be able to use your phone number. 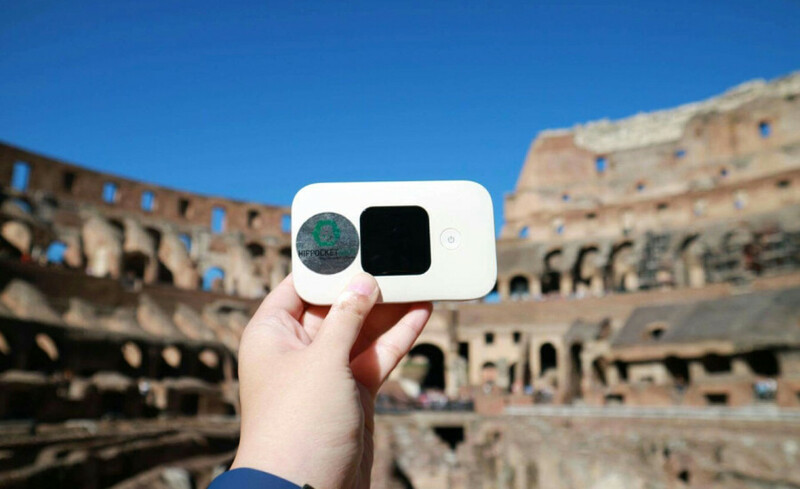 You can rent your pocket wifi for Italy from only 4.90€/day on our website Hippocketwifi.com, and you will have unlimited data in France and 1GB of data per day in Italy and anywhere else in Europe. The main benefit of this solution is that you can connect up to 10 devices to the network. In this way, if you are travelling with others people, the costs can easily be shared. More information about the pocket wifi renting for Italy here.